Sold in carton quantities only. Max out your storage space with Quantum's highest-capacity Shelf Bin. Built with the same great benefits as all Quantum Shelf Bins, but with 95% more storage capacity than the 4" Economy and 65% more than the 6" Store-More. Store-Max: An industry first, and now an industry standard. Tilts out for complete access when on shelving thanks to the built-in rear hanglock. Complete access and easy content I.D. with the wide hopper front. Added strength from reinforced edges. Optional Extended Label Holders, LTR-1253 Clear Label Holders with Laser Label Inserts and Bin Cups also available. Please see Options tab for details. Sold in carton quantities only. Priced per carton. Allows for larger bar code scanning thanks to a design that slides into the molded-on label slot on bins. Provides a 2-1/4"Hx4"W angled surface. Image shows the ELH410 10° Angle on the left and the ELH445 45° Angle on the right. Compatible with Economy 4" Shelf Bins, Store-More 6" Shelf Bins and Store-Max 8" Shelf Bins. Note: Fits all sizes Shelf Bins except QSB100. Sold in cartons of 25. Prices are per carton. Easy-to-read labels in a protective insert. Laser and inkjet compatible inserts come in 8-1/2"x11" perforated sheets. Each package includes 25 clear holders and corresponding printer-friendly sheet labels. Store-Max 8" Shelf Bin – all sizes. 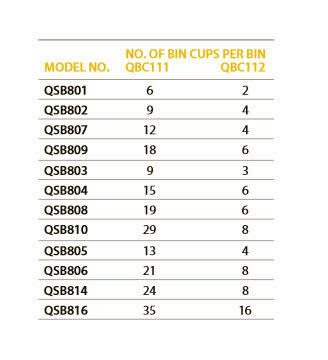 QuickPick Bins – all sizes. Ultra Stack and Hang Bin QUS224. 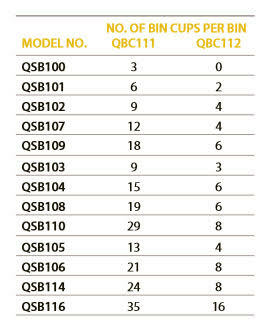 Ultra Stack and Hang Bin models QUS200 / QUS210 / QUS220. Magnum Bins – all sizes. Ultra Stack and Hang Bin models QUS221 / QUS230 / QUS234 / QUS235 / QUS239 / QUS240 / QUS241 / QUS242 / QUS245 / QUS250 / QUS255 / QUS260 / QUS265. 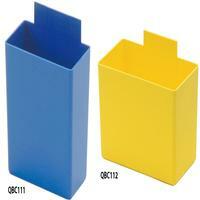 Stackable Shelf Bins - all sizes. Ultra Stack and Hang Bin models QUS270 / QUS275MOB. LTR-1253 Label holder measures 1-1/4" x 3"
LTR-1300 Label holder measures 1" x 3"
LTR-1754 Label holders measure 1-3/4" x 4"
LTR-2400 Label holders measure 2" x 4"
Sold in cartons of 48 only. Two sizes. Available in Blue or Yellow. 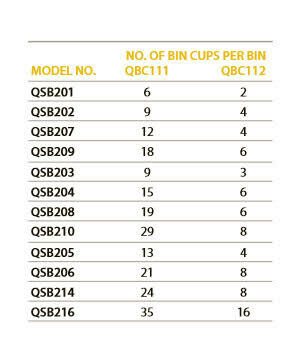 To see how many Bin Cups each bin model will hold, please scroll down to the tables below. Easy refills parts retrieval – entire cup may be removed. Easy part labeling via individual label slots. Optional black dividers fit snugly, horizontally across bins to create compartments. Each bin accepts up to 7 dividers.